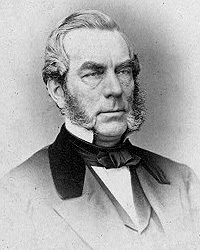 Edwin D. Morgan was “a courageous and high-minded New York merchant who served with distinction in the legislature and as state and national party chairman,” wrote historian Glyndon Van Deusen.1 “He was shrewd, austere, and cautious, but when he made up his mind, he was bold and impatient for proper execution of his ideas,” wrote Roscoe Conkling biographer David M. Jordan.2 Morgan was a 19th century Horatio Alger story — rising from a humble family in Connecticut to the pinnacle of the business world in New York and the pinnacle of the political world in Washington. He was compassionate, conscientious and conservative. 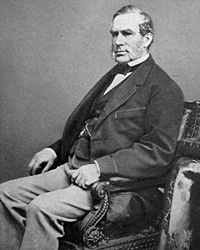 From 1856-64 and 1872-1876, Morgan served as chairman of the Republican National Committee; he chaired the Republican’s national campaign committee in 1860. His business career had expanded from that of a Hartford, Connecticut grocer to a prosperous New York City banker, broker, and merchant with connections to railroads and utilities. 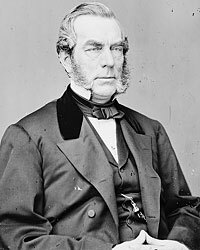 He broke into politics a Whig — serving as a New York City Alderman, president of the city’s Board of Aldermen, State Senator (1850-1853) and chairman of the New York Whig Central Committee. He switched to the Republican Party in 1855 and was elected to two terms as Governor beginning in 1858 and one term as Senator in 1863. His post-Civil War political career was relatively unsuccessful. Although he chaired two more Republican conventions — in 1872 and 1876, he lost subsequent elections for Senate and Governor. Basically a conservative, Senator Morgan had joined Radical Republicans in opposing the policies of President Andrew Johnson in curtailing the rights of blacks in the South. In the summer of 1858 the Republicans of New York were to designate a candidate to succeed Mr. King as governor. Mr. Weed’s earliest choice was Simeon Draper. Arrangements were on foot, looking to his nomination, when, a few weeks before the convention, Mr. Draper became so seriously embarrassed in business enterprises as to occasion a sudden and unexpected failure. All his time, therefore, was engrossed in the adjustment of his own affairs. The name of James M. Cook, of Saratoga, who had served creditably to himself and usefully to the State as Senator, Bank Superintendent, and Comptroller, was then hastily canvassed…. As Governor of New York, Morgan played an important role in the mobilization of New York. Immediately after the attack on Fort Sumter, the State Legislature granted to a seven-member military board authority to deal with crisis. The delegation of authority to the board rather than to the governor assured that the response to the emergency would be cumbersome. “Edwin D. Morgan acted in a triple capacity to supply the material needs of the troops. He was a member of the Military Board, which had been dowered with three million dollars to arm and equip 30,000 men. Because he shared this authority with a plural executive he was severely hampered,”wrote biographer James A. Rawley. “Secondly, he administered a fund of $50,000 appropriated in the Act of April 17 for defense of the State. A third responsibility conferred upon him and others by Lincoln made him an agent of the Federal government in the purchase of its supplies.”24 Morgan had a fourth power. In order to strengthen his authority and facilitate his assistance for President Lincoln’s war efforts, on September 28, 1861, Morgan received a major general’s commission in the volunteer army. He held that commission until almost the end of his gubernatorial term. To not shirk just responsibility, I suppose I ought to admit that I had much to do with the matter of which you complain. The committee came here some time last week, saying there were fourteen Regiments in N.Y. city, not within the 38 you were organizing; thatsomething must be done with them,—that they could not safely keep them longer, nor safely disband them. I could not see—can not yet—how it could wrong you, or the Regiments you were raising, for these 14 to move forward at once, provided yours, too, should be received when ready. But aware of my own ignorance in military matters, I sent to Genl. [Winfield] Scott to get his opinion whether the thing could be safely done, both as to the question of confusion, and also whether the Govt. could advantageously keep and use the whole. His answer was that theWhole should come—of the 14[,] 5 to come here, & 9 to Fortress Monroe. I thought the whole difficulty was solved, and directed an order to be made accordingly. I was even pleased with it; because I had been trying for two weeks to begin the collecting of a force at Fortress Monroe, and it now appeared as if this would begin. Next day & after the committee had gone, I was brought to fear that a squabble was to arise between you and the committee, by which neither your Regiments nor theirs, would move in any reasonable time; to avoid which, I wrote one of the committee—Mr. Russell—to send them at once. I am very loth to do any wrong; but I do not see yet wherein this was a wrong. I certainly did not know that any Regiments especially under your control were to be sent forward by the committee; but I do not perceive thesubstantial wrong, even in such a case. That it may be a technical wrong, I can readily understand—but we are in no condition to waste time on technicalities. The enthusiastic uprising of the people in our cause, is our great reliance; and we can not safely give it any check, even though it overflows, and runs in channels not laid down in any chart. “It is remarkable, you say? He is only an orderly sergeant, and he has no commission, but he is actually in command of all there is left, several companies, of a fine regiment of cavalry. We will go over into the President’s room, at all events, and state the case to him. It is easy to get his attention to it, of course, and he listens, and he takes the letters and reads them, and he seems to be pondering important matters suggested to him. “The convention which assembled in Baltimore June 7, 1864, was not fortunate in its presiding officers,” wrote contemporary journalist Noah Brooks. “Ex-Governor E.D. Morgan of New York, as chairman of the National Committee, called the convention to order, but did not long remain in the chair, for which he had not marked aptitude.”48 Having made his speech, Morgan was replaced as chairman by Robert J. Breckinridge, a Kentucky minister. A test of Morgan’s political strength came which Morgan disapproved. It began when Lincoln, acting upon Chase’s recommendation, named John T. Hogeboom as appraiser at large in the New York Custom House. I have just received your note and have read it with great attention. I was not aware of the extent of the embarrassment to which you refer. In recommendations for office I have sincerely sought to get the best men for the places to be filled without reference to any other classification than supporters and opponents of your administration. Of the latter I have recommended none; among the former I have desired to know no distinction except degrees of fitness. The withdrawal of Mr. Cisco’s resignation, which I enclose, relieves the present difficulty; but I cannot help feeling that my position here is not altogether agreeable to you; and it is certainly too full of embarrassment and difficulty and painful responsibility to allow in me the least desire to retain it. Glyndon Van Deusen, Thurlow Weed: Wizard of the Lobby, p. 236. David M. Jordan, Roscoe Conkling of New York: Voice of the Senate, p. 113. James A. Rawley, Edwin D. Morgan, 1811-1883: Merchant in Politics, p. 267. James A. Rawley, Edwin D. Morgan, 1811-1883: Merchant in Politics, p. 268. James A. Rawley, Edwin D. Morgan, 1811-1883: Merchant in Politics, p. 138. P.J. Staudenraus, editor, Mr. Lincoln’s Washington: The Civil War Dispatches of Noah Brooks, p. 135 (1863). William B. Hesseltine, Lincoln and the War Governors, p. 30. Sidney David Brummer, Political History of New York State During the Period of the Civil War, p. 34-35. James A. Rawley, Edwin D. Morgan, 1811-1883: Merchant in Politics, p. 50. James A. Rawley, Edwin D. Morgan, 1811-1883: Merchant in Politics, p. 60. Chauncey M. Depew, My Memories of Eighty Years, p. 20. Thurlow Weed Barnes, editor, Memoir of Thurlow Weed, Volume II, p. 251-252. William B. Hesseltine, Lincoln and the War Governors, p. 31. Reinhard H. Luthin, The First Lincoln Campaign, p. 17-18. Allen Thorndike Rice, editor, Reminiscences of Abraham Lincoln by Distinguished Men of His Time, p. 256-257 (William D. Kelly). Allen Thorndike Rice, editor, Reminiscences of Abraham Lincoln by Distinguished Men of His Time, p. 257-260 (William D. Kelly). Helen Nicolay, “A Candidate in His Home Town”, The Abraham Lincoln Quarterly, September 1940, p. 131. James A. Rawley, Edwin D. Morgan, 1811-1883: Merchant in Politics, p. 117 (Letter from Abraham Lincoln to Edwin D. Morgan, September 20, 1861). David Morris Potter, Lincoln and His Party in the Secession Crisis, p. 115. James A. Rawley, Edwin D. Morgan, 1811-1883: Merchant in Politics, p. 122 (Letter from Edwin D. Morgan to Abraham Lincoln, December 16, 1860). James A. Rawley, Edwin D. Morgan, 1811-1883: Merchant in Politics, p. 123. Abraham Lincoln Papers at the Library of Congress. Transcribed and Annotated by the Lincoln Studies Center, Knox College. Galesburg, Illinois. (Letter from Edwin Morgan to Abraham Lincoln1, June 4, 1860). James A. Rawley, Edwin D. Morgan, 1811-1883: Merchant in Politics, p. 153. James A. Rawley, “Lincoln and Governor Morgan”, Abraham Lincoln Quarterly, March 1951, Volume VI, No. 5, p. 285-286. Roy P. Basler, editor, The Collected Works of Abraham Lincoln, Volume IV, p. 375-376 (Letter to Edwin D. Morgan, May 20, 1861). William O. Stoddard, Inside the White House in War Times, p. 127-128. William B. Hesseltine, “Lincoln’s War Governor”, Abraham Lincoln Quarterly, Volume IV, No. 4, December 1946, p. 180. James A. Rawley, Edwin D. Morgan, 1811-1883: Merchant in Politics, p. 184. William O. Stoddard, Inside the White House in War Times, p. 128. William B. Hesseltine, Lincoln and the War Governors, p. 199. Roy P. Basler, editor, The Collected Works of Abraham Lincoln, Volume V, p. 297 (June 28, 1862). Roy P. Basler, editor, The Collected Works of Abraham Lincoln, Volume V, p. 296 (July 1, 1862). Roy P. Basler, editor, The Collected Works of Abraham Lincoln, Volume V, p. 296 (Letter to Edwin D. Morgan, July 3, 1862). Henry Raymond, The Life of Abraham Lincoln, Volume II, p. 752. James A. Rawley, Edwin D. Morgan, 1811-1883: Merchant in Politics, p. 182. James A. Rawley, Edwin D. Morgan, 1811-1883: Merchant in Politics, p. 186. Sidney David Brummer, Political History of New York State During the Period of the Civil War, p. 272. James A. Rawley, Edwin D. Morgan, 1811-1883: Merchant in Politics, p. 186 (Letter from Edwin D. Morgan to Thurlow Weed, January 27, 1863). Gideon Welles, Diary of Gideon Welles, Volume I, p. 232 (February 3, 1863). James A. Rawley, Edwin D. Morgan, 1811-1883: Merchant in Politics, p. 188 (Letter from Edwin D. Morgan to Thurlow Weed, February 3, 1863). William Frank Zornow, Lincoln & the Party Divided, . Gideon Welles, Diary of Gideon Welles, Volume II, p. 28 (May 11, 1864). Gideon Welles, Diary of Gideon Welles, Volume II, p. 30 (May 13, 1864). Roy P. Basler, A Touchstone for Greatness, p. 198. Richard Current, The Lincoln Nobody Knows, p. 229. Noah Brooks, Washington in Lincoln’s Time: A Memoir of the Civil War Era by the Newspaperman Who Knew Lincoln Best, p. 142. James A. Rawley, “Lincoln and Governor Morgan”, Abraham Lincoln Quarterly, March 1951, Vo. VI, No. 5, (292-293). John Niven, Salmon P. Chase: A Study in Paradox, p. 364-365. David Donald, editor, Inside Lincoln’s Cabinet: The Civil War Diaries of Salmon P. Chase, p. 215-216 (June 27, 1864). Roy P. Basler, editor, The Collected Works of Abraham Lincoln, Volume VII, p. 412-413 (Letter to Salmon P. Chase June 28. 1864). Roy P. Basler, editor, The Collected Works of Abraham Lincoln, Volume VII, p. 414 (Letter to Salmon P. Chase, June 28, 1864). Roy P. Basler, editor, The Collected Works of Abraham Lincoln, Volume VII, p. 414 (Letter from Salmon P. Chase to Abraham Lincoln, June 28, 1864). Roy P. Basler, editor, The Collected Works of Abraham Lincoln, Volume VII, p. 414 (Letter from Salmon P. Chase to Abraham Lincoln, June 29, 1864). Gideon Welles, Diary of Gideon Welles, Volume II, p. 62. David Donald, editor, Inside Lincoln’s Cabinet: The Civil War Diaries of Salmon P. Chase, p. 218-219 (June 28, 1864). David Donald, editor, Inside Lincoln’s Cabinet: The Civil War Diaries of Salmon P. Chase, p. 220-221 (June 29, 1864). James A. Rawley, “Lincoln and Governor Morgan”, Abraham Lincoln Quarterly, March 1951, Vo. VI, No. 5, p. 292-293. James G. Randall, Lincoln the President: Last Full Measure, p. 277-278.